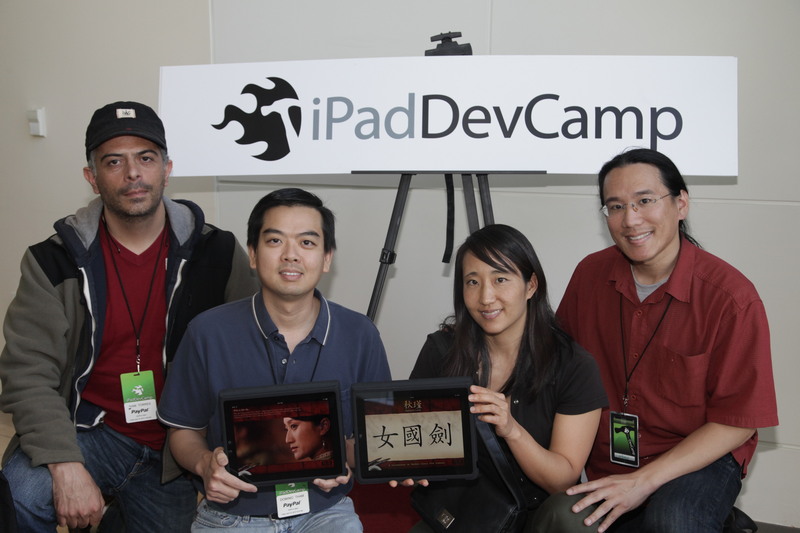 Our Autumn Gem application for the iPad won the Future of Publishing Award at iPadDevCamp! We developed this application to show the potential marriage between film and iPad. Going beyond a normal movie, we bring the story of Modern China’s first feminist, Qiu Jin, to life with interactive elements, historical information and movie clips from our film. Unfortunately, we only heard about the award after the event was over. The judges created several new awards categories during the judging process, and they accidentally forgot to mention our application! No worries, we’re happy that our app was recognized by the selection committee! The free iPad which is part of the award will be going to Ivan and Dominic from XBureau, who assisted us in developing the application; we couldn’t have done it without them! It was a completely random encounter that caused us to meet. On Friday night, I was standing in line waiting to talk to Chris Allen, one of the organizers of iPadDevCamp. I was holding my 5D Mark II, which was mounted onto my Zacuto Tactical Shooter. Ivan noticed my rig and asked me some questions about it. During our conversation, I told him about the film and my app idea; later on in the evening, he came up to me with Dominic and said they were interested in working on the app. Two days of furious coding, Photoshop, Final Cut, and After Effects later, here we are with a now award-winning app! Wow! Congrats Adam on coming up with such a cool idea/ap, and congrats to Rae and Ivan and Dominic for the collective win. I’m looking forward to seeing your ap on an iPad!